When someone mentions mice, many of us think of the cute and funny characters of Mickey and Minnie Mouse, Stuart Little, and Jerry from Tom and Jerry. Although these characters entertained us throughout our childhood and maybe still do today (don’t worry we all enjoy a good cartoon every now and then). Nevertheless, talking mice on TV and the ones in real life are two different animals. They may be tiny, but mice are much more complicated creatures than we assume them to be. In fact, they are very similar to humans in how their bodies and minds function. Although this similarity is extremely helpful when testing modern medicine, it is not so convenient when they decide to take residence in your home. To fully understand how to rid oneself of these little creatures and prevent them from coming back, it is important to understand their traits and the signs they leave in your home. A mouse, as many of you know, is a small rodent with a furry round body, pointy nose, and long hairless tail – they can actually be quite cute if they are not infesting your home. These animals come in a variety of colors and sizes, most commonly they are white, brown, and grey and tend to be the size of a small potato. Despite their small size, mice can move about and throughout your home with ease. They are excellent climbers and jumpers and can squeeze into openings that are much smaller than their bodies. At around 4 to seven weeks old, a female mouse will mate and have young. She will carry her young for 19 to 21 days and give birth to four to a dozen babies, according to the University of Florida. Mice can have a new litter of babies every three weeks. Wild mice usually only live around 1 to 2.5 years. However, this is indeed long enough to wreak havoc on your home. If you believe what you see in cartoons, you would think that mice eat cheese. However, they actually tend to eat fruits, seeds, and grains. Don’t let this Hollywood style diet fool you – mice are omnivores. Therefore, like a woman on the second day of her juice cleanse, if food is scarce they will eat pretty much anything in their way…even each other. Since mice eat around 20 times a day, they will usually make their homes close to food sources (8 meters away or less to be exact). So keep an eye out around your kitchen for a family of little-unwanted guests trying to steal your goodies. When dealing with an infestation, it is really important to understand the difference between mice and rats. Though they are usually associated together, they are actually completely different animals in the rodent family. Rats are usually much larger and uglier than mice. Much like a mouse’s ugly cousin, they share many of the same living traits, but rats have a balding problem and can be twice the size of mice. These signs can be critical in locating mice nesting areas. The nests are normally made up of shredded fibers and other household materials, and they are usually located in undisturbed areas (shoeboxes, storage crates, etc.). Infestations can cause extreme damage to your property and home if not dealt with immediately. 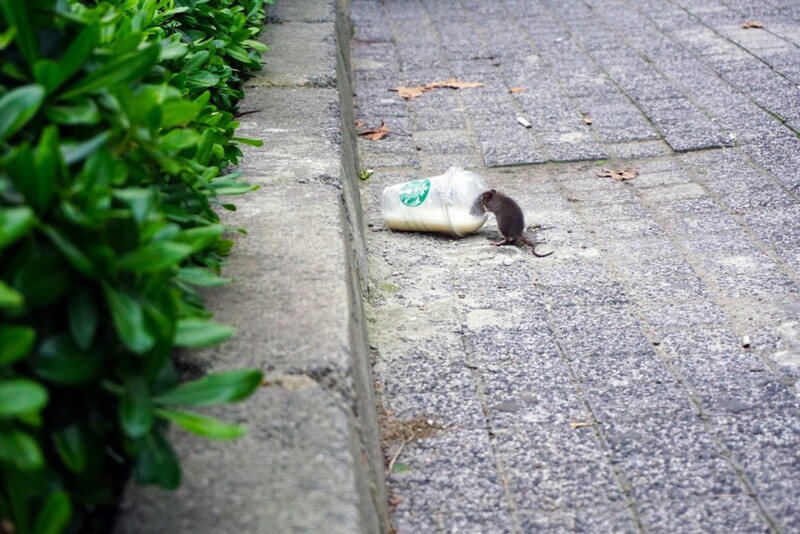 The mice not only contaminate the food they are snacking on but they can pollute other items with droppings, urine and saliva (which can spread diseases to you, your friends, your dog, pretty much anything that consumes the infected food – not so cute anymore). Remember, mice are reproducing machines. One female mouse can produce as many as ten litters in one year. Therefore, it is crucial to address any suspicion of infestation early and expeditiously before Stuart Little and his ever-expanding family aren’t so little anymore. The first link that shows up when you google “How to get rid of mice” is to a website that sites many home remedies to send the little-uninvited guests running for the hills. However, most of the time those are not very effective and will lead to you making strange concoctions. The only benefit of experimenting with these is that the mice receive some free entertainment – not the outcome you are shooting for. The standard mouse traps that one would purchase from a store or online work exceptionally well. Today, there are many different kinds of traps you can buy. Some are more humane than others, but all in all are equally effective in capturing mice. Before laying the traps, it is important to assess the traffic patterns of your guests. Locating the entry and exit points through small spaces will help to ensure the mice can’t avoid entering the trap as they pass by. One effective trap used by many exterminators today is a sticky pad. With this solution, the mouse gets stuck to the pad and simply dies from hypothermia. Supposedly this is one of the more humane methods, and cleanup is relatively easy. Just discard the pad and mice and replace with a new clean sticky pad. It is worth investing in these to materials to seal up cracks and holes where mice can enter through. Mice can fit through holes the size of small coins and can gnaw their way to make the opening lager. On the bright side, mice cannot gnaw through caulk or steel wool – so you are in luck! If you’re sheepish about tending to mouse traps and the resultant catch, you can always call a professional who will efficiently and effectively address the issue and resolve it often with a guarantee for follow-up service if you have repeat offenders. The technicians also have extensive knowledge about dealing with these little creatures and can give you tips or take action for you to prevent them from coming back for another visit. There are many things you can do to prevent mice from coming back such as mouse proofing, pest control methods, etc. However, the easiest way to prevent the real-life form of Mickey and Minnie from coming back is by staying clean and tidy. Keep all of your food in sealed containers (glass containers are the best), take out your trash regularly, and clean up crumbs from the counter and floor. I promise you if you make it impossible for mice to reach your food, even if they come by for a visit, they will be gone within a day to find a better food supply.